Welcome to the September 2017 issue of GL Communications' Newsletter providing information and insight into our enhanced ED-137 Radio Emulator referred to as MAPS™ ED-137 Radio Emulator. 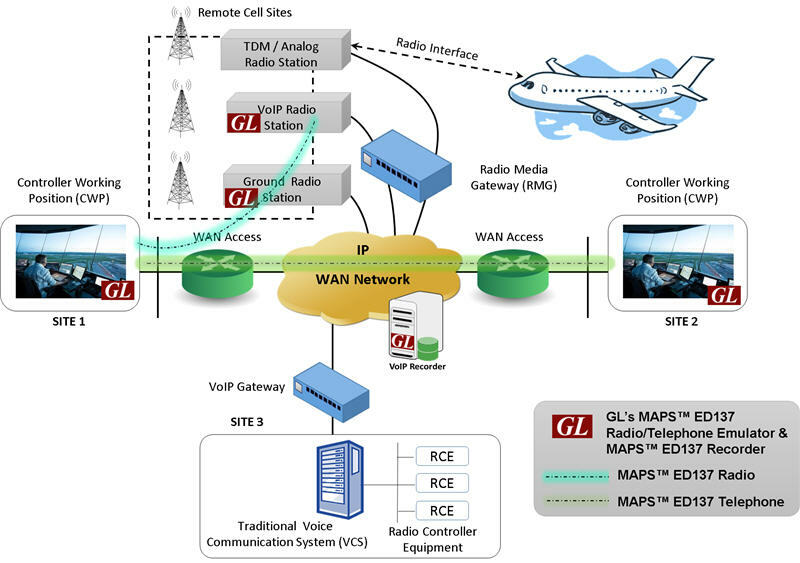 Continuing with our efforts to improvise test tools for Air Traffic Control and Management industry, GL has enhanced MAPS™ ED-137 Radio to simulate VoIP Air-Ground calls as per EUROCAE ED-137C Volume 1 Radio version along with the existing ED137B Volume 1 Radio version. 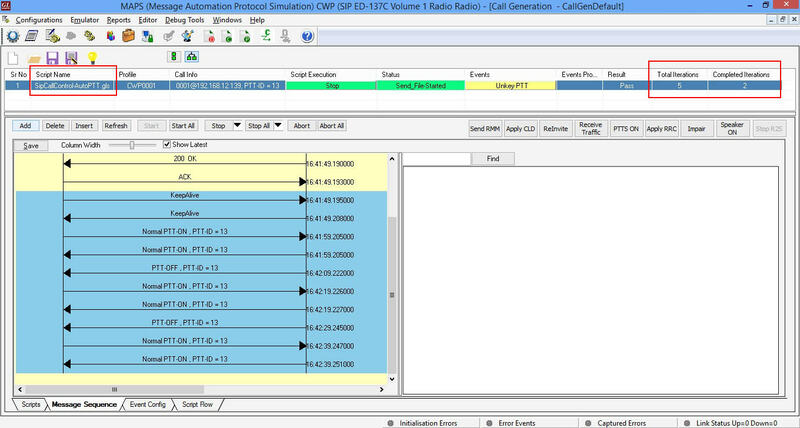 The MAPS™ ED-137 Radio simulator software provides complete control over call scenarios testing, and the ability to customize the network parameters for signalling and VoIP traffic. It has the capability of generating more than 500 simultaneous Air-Ground calls. Sample script provided to perform automated periodic Push-To-Talk (PTT) and Squelch (SQU) operations on Air-to-Ground (A-G) calls. In Multicast mode operation, multiple CWPs can send request to have multicast session with GRS to receive multicast RTP packets from GRS. CWP sends an INVITE request with SDP body containing multicast group address and TTL value to GRS. The GRS which supports multicast will extract the multicast address from SDP body in INVITE and starts sending the R2S/RTP packets to this multicast address. CWPs will send Internet Group Management Protocol (IGMP) join request to join the group and start receiving the multicast RTP packets. The router or switch with multicast feature will manage the subscription to multicast group and forwards the RTP packets received from GRS to all members of the group. The image below depicts the process. SELCAL is a signalling method used to alert the aircraft crew members selectively to an incoming message from a ground station. 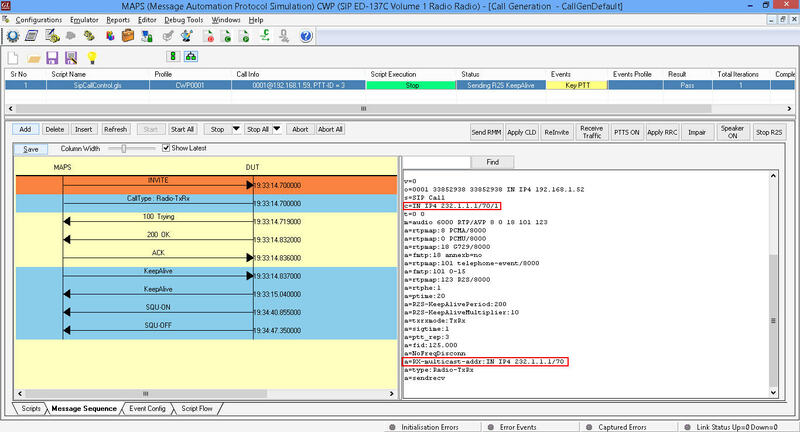 The CWP endpoints simulated by MAPS™ ED137 Radio supports sending SELCAL tones to GRS using the SIP INFO method. SELCAL tone defined in CWP profile will be sent in the body of INFO message as shown in image below. GRS replies with 200 OK message to INFO request and sends Normal PTT_ON confirmation with PTT-ID=63 in RTP downstream header to CWP. PTT-ID=63 is reserved for SELCAL tone transmission at GRS. PTT priorities are handled at GRS as per ED137C for this transmission. 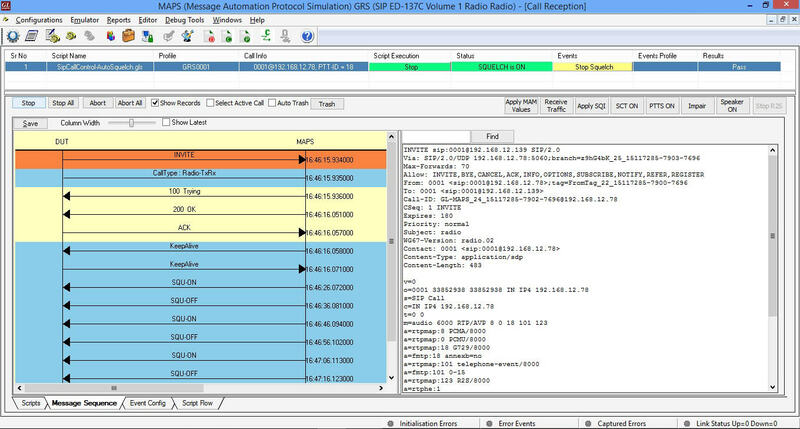 GRS endpoints simulated by MAPS™ ED137 Radio supports simulation of non-VoIP source PTT Keying. 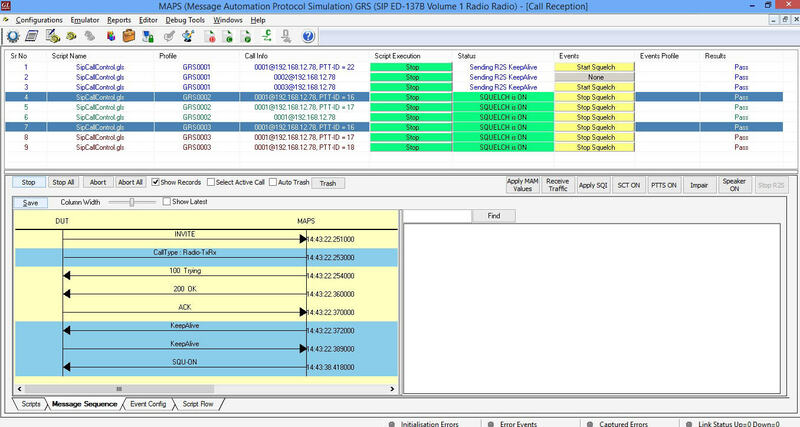 User can simply apply “Key non-VoIP PTT” event on the selected Radio call at GRS. This will trigger GRS to send Normal PTT_ON confirmation with configured PTT-Id (60, 61 or 62) in RTP downstream header to all CWPs indicating that PTT from a non-VoIP source is being transmitted at GRS. PTT-Ids 60, 61 and 62 are reserved for non-VoIP sources. The image below shows the non-VoIP source PTT ON/OFF confirmations on the call graph. WG67 Key-In Package is updated to reflect the current frequency-id (fid) of the GRS. Whenever there is a change in the frequency-id, GRS sends NOTIFY message with new frequency-id to all the active CWPs. The NOTIFY message body will contain frequency-id and all active sessions information like PTT-id, SIP From URI and Call Type. The image below depicts the procedure. 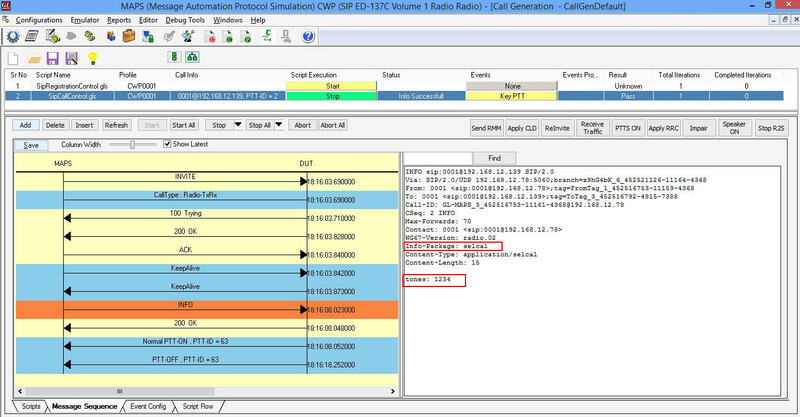 CWP end points can include the disconnection mode SDP attribute (‘NoFreqDisconn’) in the SIP INVITE message to inform GRS not to terminate the session when GRS changes its frequency id. The GRS supporting this feature will retain the sessions received with this SDP attribute and terminates other sessions when frequency id changes. CWP end points support sending Test PTT signal to GRS. Test PTT has the lowest precedence among all the PTT types and GRS handles its precedence as per ED137C. 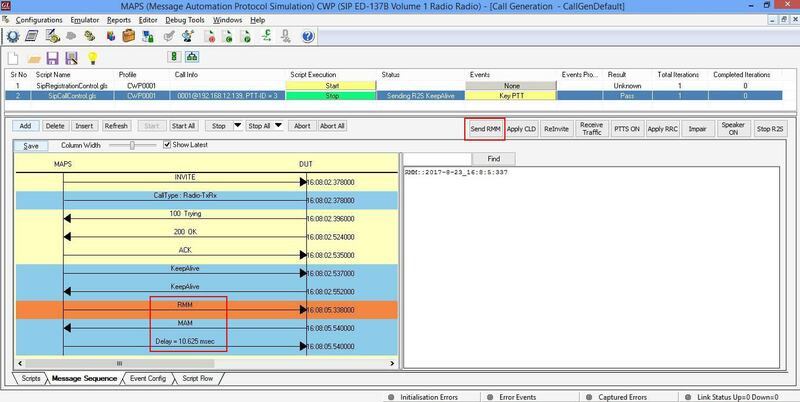 Enhanced MAPS™ ED-137B Radio adds Dynamic Delay Compensation as an additional feature specific RTP extension block used to introduce varying delay values at GRS in lab environment without actually making the real-time measurements. 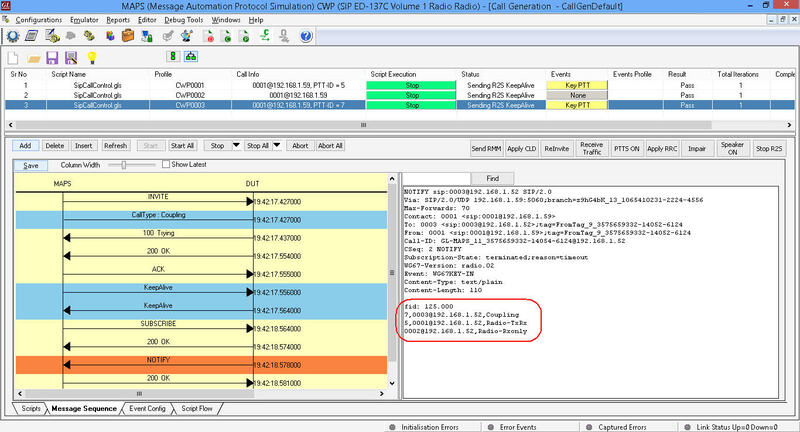 Once the Air-to-Ground call is established, CWP can send Dynamic Delay Compensation messages such as RMM to GRS. GRS replies with MAM. Message for each RMM received. MAPS™ uses only relative time to calculate delay. After receiving the MAM message from GRS, delay is calculated and displayed in the message sequence graph along with RMM and MAM messages, as shown in the image below. Now with enhanced MAPS™ ED137B Radio, it is possible to perform squelch on multiple Radios simultaneously by selecting a session of each radio and applying "Start Squelch" event. The image below depicts squelch on all connected sessions of Radio2 (GRS0002) and Radio3 (GRS0003). Enhanced MAPS™ ED137B Radio includes a custom scripts to perform auto SQUELCH and PTT actions on Air-to-Ground calls. The custom script ‘SipCallControl-AutoSquelch.gls’ has an initialization section (Auto Squelch Configurations), which allows user to configure parameters required to control the behaviour of auto SQUELCH. Whenever an A-G call is received, automatic squelch action is performed over the call as per the parameters configured in the script. The image below depicts the process. 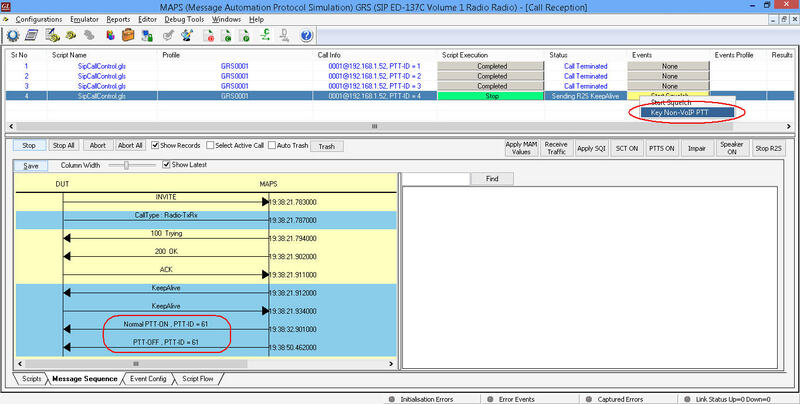 Similarly, to perform automatic periodic PTT on Air-to-Ground calls, MAPS™ ED137B Radio includes custom ‘SipCallControl-AutoPTT.gls’ script, where the parameters required to control the behaviour of auto PTT are configured in the initialization section of the script. When MAPS™ ED137 Radio (CWP) generates calls, the PTT action is performed automatically as per the parameters configured in the script. The calls can also be placed repetitively with “Inter-call duration” (as configured in the “Global Configurations”) till the defined iterations are reached. Periodic auto PTT action performed over the Air-to-Ground call is displayed in the message sequence graph as depicted in the image below. For comprehensive information on the application, please visit MAPS™ ED-137 Emulator web page.